Cuisine in the Philippines is as rich as its culture and history. Having been a colony of Spain for 300 years and of the U.S.A. for several decades, the Filipino cuisine can be considered a salad bowl of Spanish, American and Malayan cooking influences. Due to their frequent interaction with Chinese people then and now, there is also community know-how on cooking Chinese dishes—with a Filipino touch. Even with various external influences at play, there are still original Filipino dishes that can be considered as regional specialties. In the agricultural lands of the Northern Philippines, the people of the Ilocos region take pride of their vegetable dish Pinakbet (or meat vegetable stew with shrimp paste). 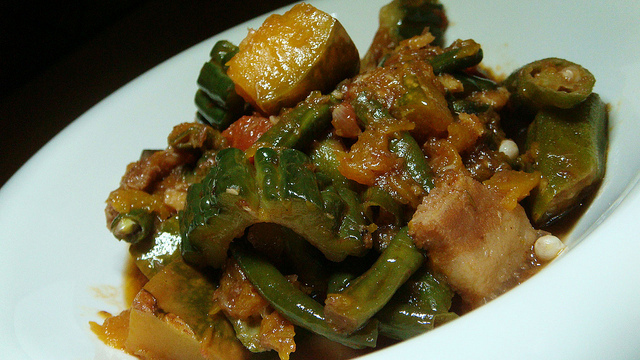 A simple yet nutritious dish, pinakbet consists of bitter gourd, squash, okra, tomatoes, onions, long beans, and cubes of pork simmered in a combination of water and tasty shrimp paste. In the same way, the Bicol region boasts of its Bicol Express, a mouth-watering pork belly dish that is simmered in coconut cream and shrimp paste. The dish is typically added with liberal amounts of chilli pepper to make it spicy and fiery hot. Since it’s hot and spicy, Bicol Express is best served with a lot of rice and cold water. One of the most popular Filipino dishes is the Adobo. Although the term “adobo” is Spanish for sauce, seasoning, or marinade, the way of cooking the dish is indigenous to the Philippines and was in the country long before any colonists came. The world-famous dish is either chicken or pork marinated in a mix of vinegar and garlic. The meat is browned or fried in oil and then simmered with spices like bay leaf, black pepper and chilli pepper. Another national pride in the Philippines is its Lechon (or roasted pork), hailed by some chefs as the finest-tasting pork dish in Asia. The dish is cooked by roasting a whole pig—stuffed with lemongrass, tamarind and other spices—over charcoal until it is tender and cooked to near perfection. The well-loved lechon is usually reserved for special occasions like weddings and birthdays.